Getting better exposure for your jobs is important to your business. We know. Free job boards can be a very effective way to attract talent, but it can be challenging to post jobs to multiple job boards at once, which is what you need to do to make the most of it. 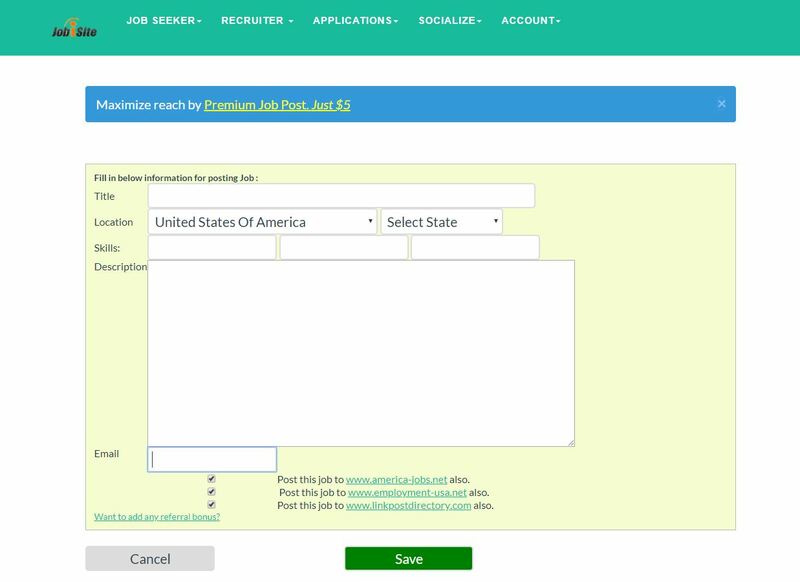 Premium jobs in jobisite.com are shared in multiple job boards. It is not as expensive as compared to other job boards and with just $10, your job gets shared in multiple job boards, aggregators and social networks. Business owners and employers now have more options in terms of where to post their jobs than ever before. This is a blessing and a burden for the modern employer. It’s a blessing because there are many avenues to explore. However, it is downright difficult to post your job across multiple job boards all by hand. There’s two key elements in getting your job post seen by the right people. The first is that you want your job to be posted to multiple job boards to maximize your reach. The second is that your job needs to be searchable and attractive to job seekers. In this article, we will walk you through how to post your job to multiple job boards and how to make sure your job gets seen by job seekers on these job boards. Earlier looking out for jobs was a task. You had to walk several miles to the offices of different jobs. There in you had to pass on your resume and do the follow up process. The manual work felt tiring and as well a long process to complete the work. Looking out for a job was something that went on for days and days. With the advancement of technology and onset of internet, the work of looking out for jobs has become pretty convenient. With a click of a mouse one can send in resume for various jobs. It is no more a time taking process and can be completed in one go. The internet is filled with numerous job portals to send in your resume. These job portals are a platform to showcase your resume and grab the best opportunity that comes down your way. It lets you give options of various job opportunities and apply there. Due to this process the person looking out for job is directly linked with the company, with the ease of posting jobs to multiple job boards with one click. The various job portals that are –Indeed.com,SimplyHired.com,qoholic.com,JobRealTime.com,JobsAggregation.com etc. Open your browser and type Jobisite.com into the URL toolbar. You should see a similar page as the image below. Once you have created your account you can see a page where you can fill in your job details. After your account has been verified, you will see a thank you page like the one below. Your job will already be listed on the Jobisite job board, but it will take several hours for your job to be live across the entire network of partner sites. You now know how to get your job listed across a lot of different job sites, but an equally important step to getting the most out of your job listings is to make sure you have the perfect job ad. You can spend hundreds (even thousands!) of dollars on job postings. However, if your job posting is no good, it will attract less applicants or applicants who just don’t really care. Whenever hiring, your first step should be to compose a perfect job ad. You need to optimize your title for search and clicks and your job description to attract applications. Your job post needs clicks in order to be read by your dream candidate. When competing with thousands of other job ads, you will need to make sure yours stands out. Instead of writing a generic title with the bare minimum, ex: “Administrative Assistant Needed”, try something more exciting. Don’t be like everyone else. Is your office busy because you are growing at an exponential rate? Do you have a dog-friendly office? Small aspects like these can vastly improve your job title. Consider what is important in your 50-60 character job title and utilize the keywords that illustrate your company! Be careful with abbreviations and using wacky expressions like “ninja” when writing your title. You will want your job ad title to be as search-friendly as possible. Yes, you have to write a job description. No, it doesn’t have to be the worst experience of your day. While including responsibilities, requirements and other basic information will be necessary, you can also make your job description shine. Just like you did with your title, write the job description to concisely and accurately portray the role. In addition to a clear representation of responsibilities and requirements for the job, insert some keywords that relate to the job opening and your industry. This is guaranteed to attract a better fit. Everybody, once upon a time, was a candidate, too. Put yourself is the candidate’s shoes. If you are applying to a job opening in 2018, what is important to you? Is it important that you be able to apply online? Is it crucial that you can apply through your mobile device? Would you be willing to complete a survey of questions as a part of your application? It is important to strike a balance your calls to action when attracting applicants. While you want to gather as much important information as possible, you also do not want to lose a candidate due to a lengthy application process. Aim for a streamlined application process. If there is an assignment or survey you want an applicant to complete, consider saving that for when you and your candidate have both expressed interest.